Written by admin on October 2, 2018 . Posted in Uncategorized. Fossil fuel divestment—sometimes called fossil-free investment, to put a more positive spin on the concept—is the most rapidly expanding movement within socially responsible investing. Compared to SRI pillars like screens for companies involved in weaponry, tobacco, and human rights abuses, going fossil-free is a bit of a latecomer to the game. But according to gofossilfree.org, by now nearly 60,000 individuals have divested more than $5 billion from fossil fuels. 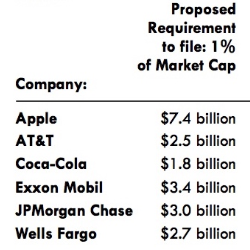 And almost a thousand institutions have divested about $6 trillion. Despite its explosive growth, many committed socially responsible investors—and certainly much of the general public—don’t know much about going fossil free with their finances. How did fossil fuel divestment start, and grow so quickly? And what’s the most effective way to adjust your portfolio if you want to get in on the movement? Like many progressive causes—from anti-war protest during the Vietnam era to sweatshop-free clothing in the 21st century—fossil fuel divestment got off the ground in college campuses. About a half dozen years ago, students started pressuring several such institutions to divest from fossil fuels. Just as crucially, administrations were called upon to proactively invest in clean energy and environmentally sustainable practices. 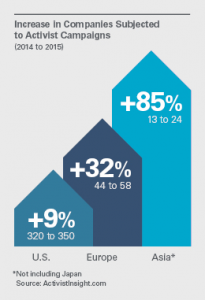 By spring 2012, the movement had spread from about half a dozen campuses to more than fifty. Today, according to gofossilfree.org, more than 850 institutions have divested or committed to doing so. This includes lots of colleges, but also plenty of faith-based organizations, philanthropic foundations, and city governments, including major metropolises like San Francisco, Seattle, and Stockholm. Even some pension funds, NGOs (non-governmental organizations), and for-profit corporations have joined the campaign. The main motivation to go fossil-free, of course, is to both combat climate change and develop safer, more sustainable energy production. But there are pretty sound financial reasons to do so too. 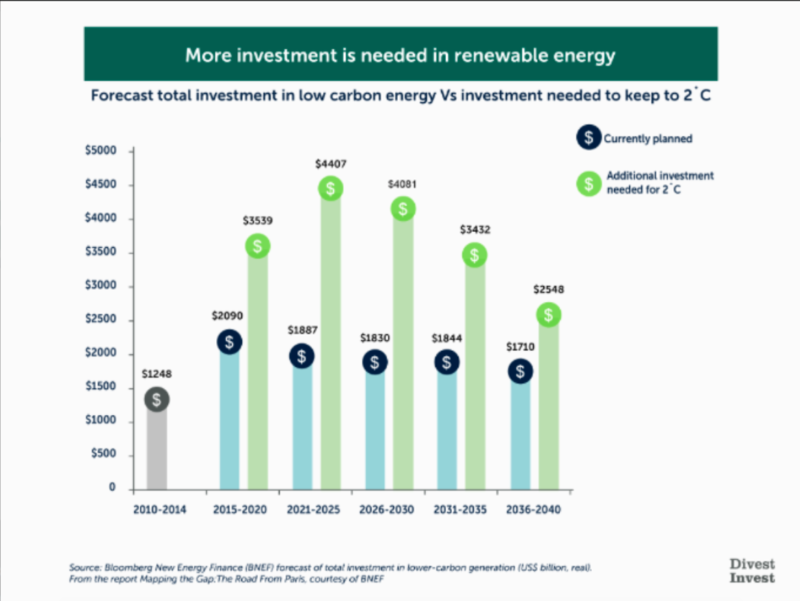 With markets around the globe and here in the US shifting investments to greener technologies (even at a time when the current administration is often hostile to such innovations), fossil fuel companies might be overvalued, and poor risks for investing even part of your assets. This “carbon bubble,” as it’s sometimes termed within the industry, has according to the DivestInvest site “already burst for the coal sector, leading to billions of dollars in losses” and bankruptcies. According to the same site, more than 75% of fossil fuel reserves will have to stay where they are—as “stranded assets”—to alleviate global warming. That would cost $33 trillion in lost revenue. It’s another factor in devaluing such companies, but also another force driving markets toward more renewable sources like solar power, whose companies could well increase in value as fossil fuel fortunes decline. As DivestInvest global director Clara Vondrich tells Effective Assets, “The clean energy transition is well underway. There is a synergy now between the falling costs of renewables and the rising costs of new fossil fuel exploration in hard to reach places, such as deepwater, the Arctic, and oil sands. “These market forces are being assisted by the mother of all market signals, the Paris Climate Agreement. As countries and subnational governments continue to make good on their Paris promise, passing policies to price carbon and otherwise limit emissions, renewable energy is the clear winner. 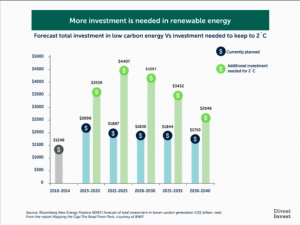 Projected growth in renewable energy investment, from divestinvest.org. Early this year, one divestment in particular took going fossil-free from the financial section into front-page headlines. On January 10, New York mayor Bill de Blasio announced the city’s pension funds would divest an astonishing $5 billion from companies involved in fossil fuel. Washington, DC had been the largest US city to divest its pension fund, as it did in 2016. But New York’s fund (totaling $189 billion in value) is, like most things in the Big Apple, yet bigger and more significant. For good measure, de Blasio also announced a lawsuit against fossil fuel giants BP Exxon Mobil, Chevron, ConocoPhillips, and Shell for the billions of dollars in damages the city has spent fighting the effects of climate change. In doing so, New York became the eighth city to sue the fossil fuel industry in a trend that’s largely rooted in Northern California, the list also including San Francisco, Oakland, Marin, San Mateo, and Santa Cruz. Outside the US, in July 2018, the Republic of Ireland became the first country to in effect divest from fossil fuels. The Irish parliament passed a bill requiring the state’s national investment fund to sell its investments in coal, oil, gas, and peat—amounting to more than 300 million pounds—“as soon as is practicable.” Elsewhere in Europe, Norway trillion-dollar sovereign wealth fund has partially divested from fossil fuels, targeting some coal companies in particular, though it’s still considering whether to sell its oil and gas holdings. But is it more effective, as some argue, to “engage” with the fossil fuel industry, via shareholder actions or other ways, to change or at least modify their policies? Or is divestment from fossil fuels the more effective strategy, or indeed the only reasonable one? The debate’s gotten big enough to leap from the financial section to the heart of the mass media. In Rolling Stone, for instance, renowned environmentalist, author, and 350.org co-founder Bill McKibben recently criticized New York State’s controller for pushing for engagement instead of divestment. The SRI community has to grapple with these pros and cons as well. To take one example, Green Century Capital Management is a mutual fund advisory company founded, managed, and owned by a partnership of non-profit environmental organizations. How does Green Century view the dilemma, considering it’s worked for engagement on some issues, but advocates divestment from fossil fuels? “Company engagement through shareholder advocacy can be successful when working with companies to adopt more sustainable business practices,” observes Green Century president Leslie Samuelrich. “Green Century has led successful shareholder engagements with over a hundred companies to stop rainforest destruction, protect water supplies, reduce carbon footprints and stop the misuse of antibiotics and mistreatment of animals. It’s great that cities and institutions have divested trillions, yet there’s a big gap—three zeros at the end of the number, pretty much—between that amount and the $5 billion individuals have divested. $5 billion is still a big sum, obviously. But what are the most important specific impacts individuals can make that might be different than the larger institutional ones? One of many fossil free movement logos, from the University of California at Berkeley. Where do you begin if you’re an individual investor — or, you could say, individual divestor? Fossilfreefunds.org’s fossil free action toolkit has some basic resources to get you on your way. For a start, it can check whether your portfolio has funds connected to fossil fuels. Click on the “Menu” icon on the top right of its home page, and you get links to a wealth of info about where fossil fuels are invested. Especially alarming is the section spelling out exactly how much major mutual fund managers have invested in fossil fuel stocks. Vanguard, for instance, has $319 billion, and American Funds $136 billion. If other managers like Franklin Templeton aren’t as waist deep in the big muddy, its $29 billion is hardly chump change. Based in Berkeley, California, Effective Assets helps clients integrate their personal, social, and environmental values with their financial objectives. In 2018 B Lab, the non-profit that certifies companies using the power of business to solve social and environmental problems, put Effective Assets on its Best of the World List of “companies leading the way to a shared and durable prosperity for all.” For more information, go to Effectiveassets.com. A good easy first step is signing As You Sow’s petition “Protect Shareholders. Strike the Financial Choice Act 2.0,” at www.change.org/p/don-t-eliminate-my-rights-as-a-shareholder-strike-the-financial-choice-act-2-0. 5Calls has a script for callers who want their representatives to “Defend Dodd-Frank Banking Regulations” at 5calls.org/issue/recIY5BMUytUixNbV. 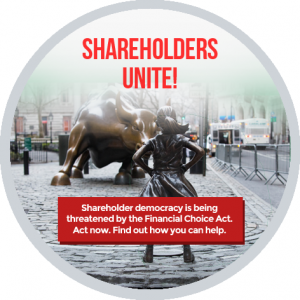 The Indivisible Explainer on the Financial Choice Act (www.indivisibleguide.com/resource/financial-choice-act-hr-10) also has more details on the legislation, as well as sample town hall questions about the act to ask your representatives. Indivisible also has a call script (www.indivisibleguide.com/resource/financial-choice-act-hr-10) if you contact their offices by phone. This letter from our colleagues at Newground Social Investment provides more detail on the threat to shareholder ownership and governance rightsin the proposed legislation.